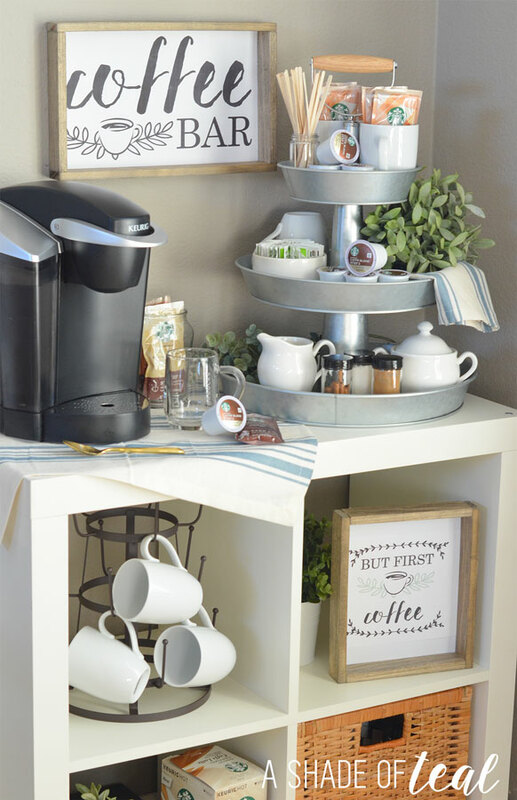 How to Setup a 3-tier Coffee Bar, Plus Free Printables! But first Coffee! It’s funny how much this has become my motto since becoming a work at home mom with a 3 year old & 3 month old! Most days I don’t even function till I have a cup of coffee, and I know I’m not the only one who can relate. I typically would go out to purchase coffee everyday, but now with 2 little one’s who has time for that! Since it literally takes me 2 hours to get out of the house I’ve been searching for delicious coffee that can be made at home. 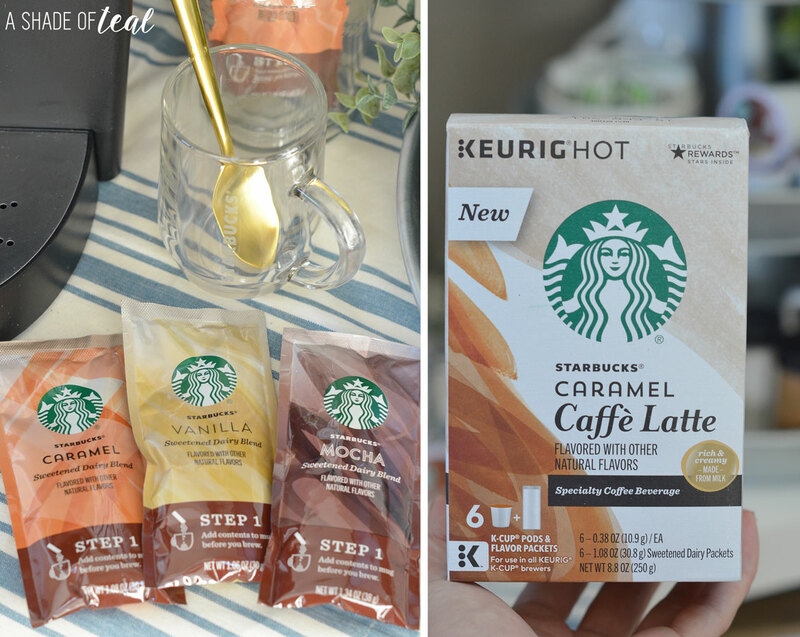 I discovered the all new Starbucks® Caffè Latte K-Cup® pods and gave them a try. The taste is amazing, it’s become the best part of my morning. I’m so in love that I decided to spruce up my coffee bar with some new decor. The new Starbucks® Caffè Latte K-Cup® pods can be found at your local grocery store and they’re okay to use on any Keurig®. In 2-step’s you’ll have an amazing cup of coffee that’s made from milk, with no artificial flavors. So get out your Keurig® and start brewing! First you’ll need to pick between the amazingly delicious flavors: Caramel, Mocha, Vanilla, or the 2 seasonal flavors of Pumpkin Spice and Peppermint Mocha (available for a limited time). Step 4 // Stir and serve! 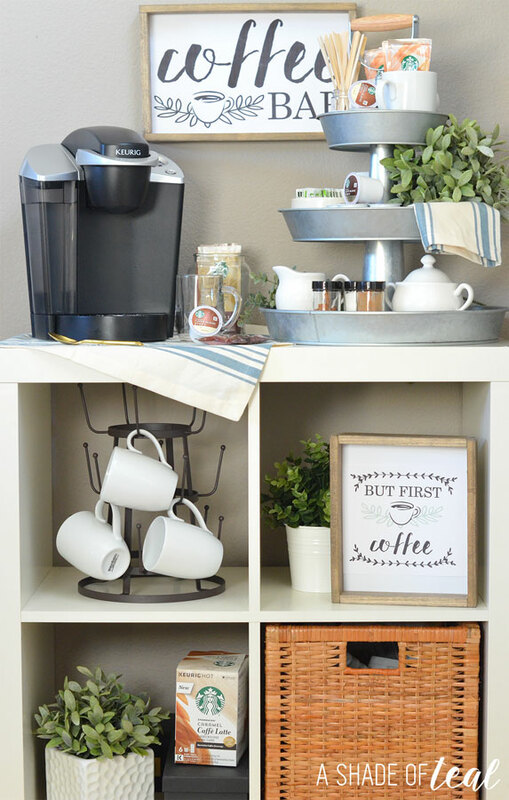 For my updated coffee bar I used my 3-tier galvanized tray and added some new printables. I have a addiction to 3-tier tray’s since I have so many. But they always seem to be a perfect place to gather supplies & decor. You can see HERE how I’ve decorated them for other areas including my nursery & farmhouse table. Have a designated station with supplies all in 1 place. 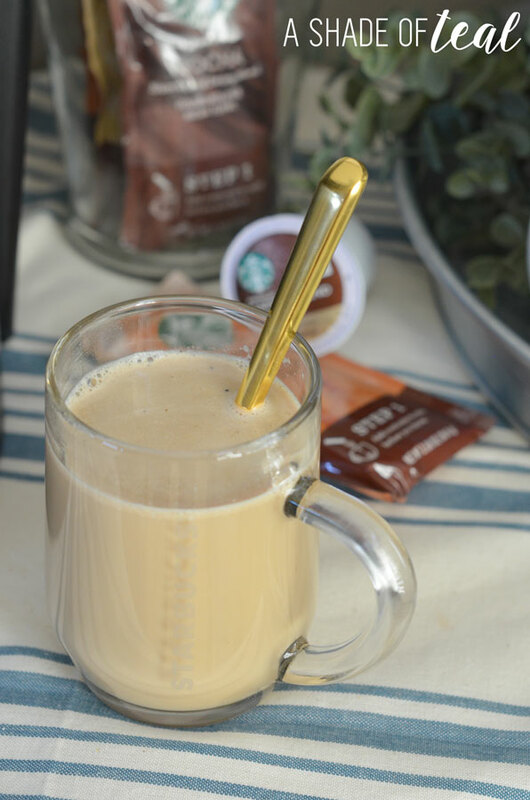 Include mugs, stirrers or spoons, sugar, sweetener, milk, cream, and Starbucks® Caffè Latte K-Cup® pods. Make sure your Keurig® always has a full supply of water. That’s the worst when you go to make coffee in the morning and there’s NO water. Add some cute Coffee Printables! I made 2 new printables for my Coffee Bar with Simple Rustic Wood Frames. Make sure you download your Free copy; and if you want to make the Rustic Wood Frames find the full tutorial here. 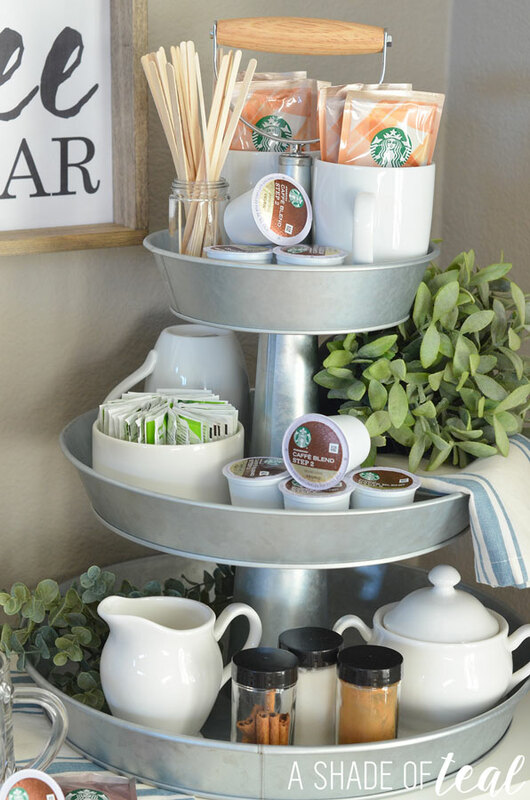 So all you coffee lovers get to your local store and pick up Starbucks® Caffe Latte K-Cup® pods and spruce up your coffee station with these cute printables! Now, I officially going to go to Starbucks now and get this. I love this two-step system! I’m always looking for anything caramel during the holidays. Thanks for the tips! What an awesome coffee bar. I don’t like coffee, but I do love the smell! Wow, I love coffee and your setup is amazing! Kinda jelly over here! This is such a cute idea! I will need to set this up for my husband. He needs something like this for quick morning coffee! This is so cool!! Next time I invite friends over, I am going to have to make one of these. They are all coffee addicts. I love Starbucks! I’ve had a gold card for a few years now. This coffee bar looks great, and I’d love to have one! It would be nice to set up something like this when entertaining guests or hosting a small private party at home. The coffee bar looks like it has everything a coffee lover would love. Thanks for the idea. I am loving that setup! The holidays are coming up and family normally visits to celebrate and it would be nice to have coffee available for them in the house any time they please! I really like this coffee bar! Well, you had me at coffee and then, sold me at Starbucks! I love this and seriously, need to try these latte cups! I love everything about your coffee bar! The extra touches like the cinnamon is fantastic! Fantastic in a guest room! Coffee lovers will surely love this little nook! I can’t wait to try my own version. The set-up looks really nice! Everything you need for a warm, cozy morning seems to be completed with this. I can share this one to a friend who needs a coffee shelf make-over! Im curious to know where the 3 tier container was purchased. Where did you get the mug rack? I’m looking for something like that to use on my own coffee bar. I love, love, LOVE this! A few questions please… what size is the “coffee bar” sign? What did you use to print it out on? Where did you get the coffee cup holder? Love it! I printed the art in cardstock and I believe one was 8.5″x11″ and 8.5″x17″. 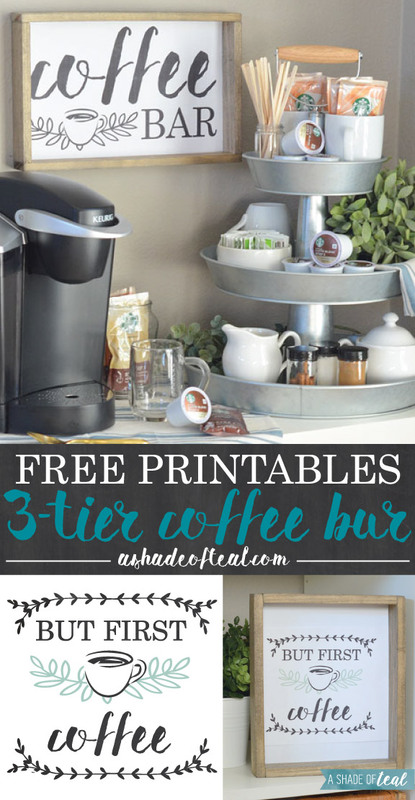 thank you for the coffee bar free printable! Such a lovely coffee corner! I see that you use the 2×2 cube shelf. Isn’t it a little short? or does it not bother you? Love this!! Where did you get the cube organizer? Hi, I was curious about where you got the small plants? They’re adorable & perfect for this set up! Love this, one of my all time faves. They should be from IKEA.